Much of Malaysian township development has followed a suburban pattern with mono-functional zoning. In addition, residential subdivisions create neighbourhoods that contain only specific house-types resulting in income-group segregation. This project is quite different to the conventional pattern. Part of it is a Honeycomb residential layout comprising a mix of duplex, quadruplex, and Honeycomb garden apartments priced from RM80,000 to RM180,000 (USD22,000 to USD53,000). Some of these houses will be just next to the area containing the semi-detached and terraced light-industry factories and warehouses. 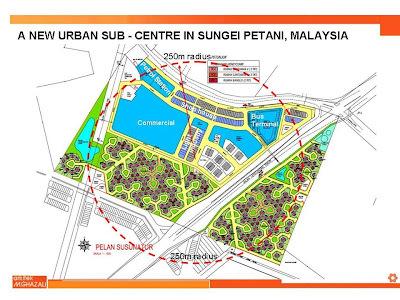 They will also be close to shops, a commercial centre and a bus terminal, all within walking distance. Tessellar > faqs: Getting Lost? This new post looks the issue of wayfinding and suggests strategies that can be used to make the Honeycomb layout easier to navigate. In short it is about exploiting the opportunities to create memorable vistas and landmarks.